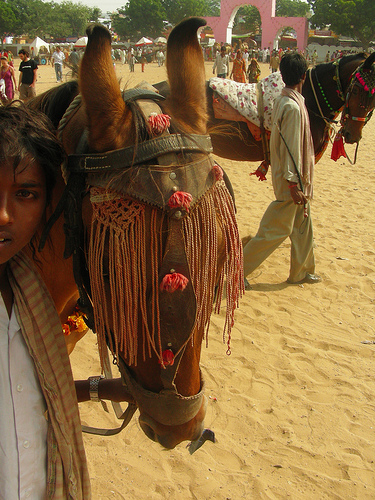 The Marwari horse, found in Rajasthan and adjoining areas, is known for its fabulous curled ears. It bears similarity in type to other desert breeds like the Arabian and Akhal-Teke, being lean and fast. I can't recommend highly enough the book "Marwari: Legend of the Indian horse " by Francesca Kelly, abundantly illustrated with glorious photos by Dale Dupree. The book is hard to find, but several used copies are available on Amazon, via the linked text above. Details about Marwari horses and interesting links, as well as information about the book, are available on Ms. Kelly's website.